If you will take a look at the chart, you will see that inventory bottomed at 5.877 units for sale in April of 2013. Since then, the number of condo and townhouse properties has climbed 63% to 9,607 units listed on the market for sale as of March. Although this is a slight drop from 9,710 units on the market last month, these levels are highly elevated to say the least. 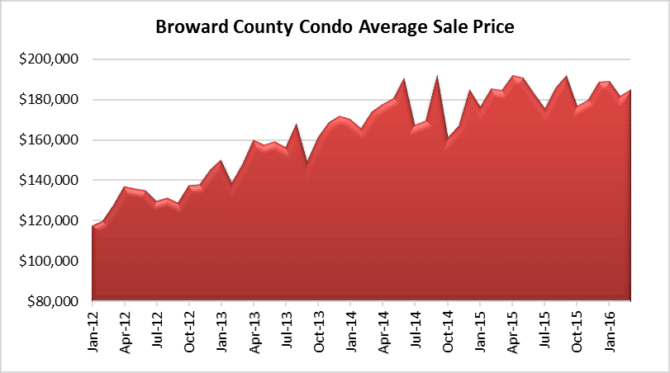 The average sale price for condo properties was $185,045 in March. That is just a slight decline of 4% from April 2015 when prices reached an interim high of $192,273. 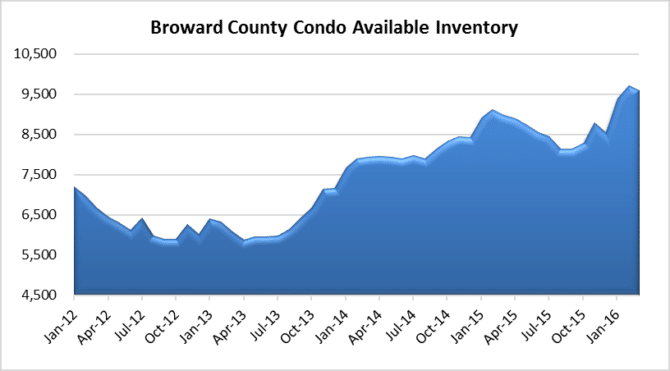 When we look through the charts of all property types throughout South Florida, we still believe that last spring was the peak for the market. 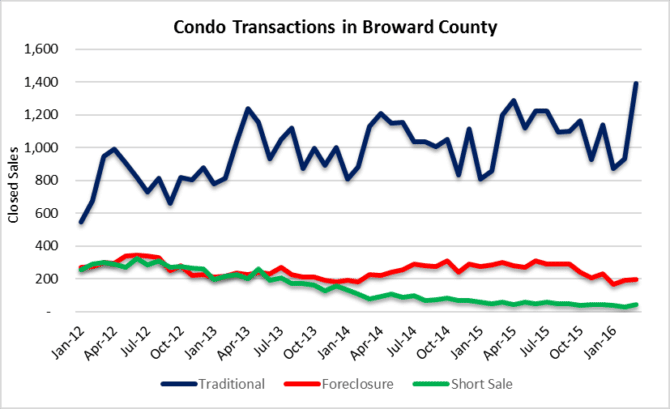 We have some good news: Transaction volume for condo properties rebounded nicely during the month of March. The total deal volume climbed 42% from 1,150 in February to 1,628 in March. The higher transaction volume helped lower the inventory number. If this persists, it will also help keep prices from dropping. If deal volume dries up and inventory builds, that will be the call for prices to look out below! 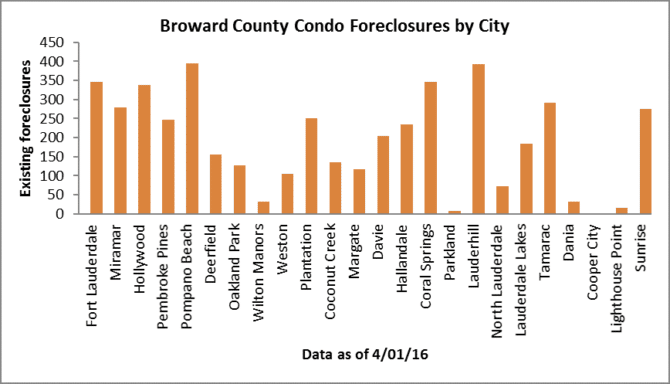 There is still a fair number of condo properties in some stage of foreclosure located throughout Broward County. Feel free to click on the chart to see which cities have part of the 4,585 units in some stage of foreclosure. Keep in mind that these don’t include units with non-mortgage foreclosures for association fees. 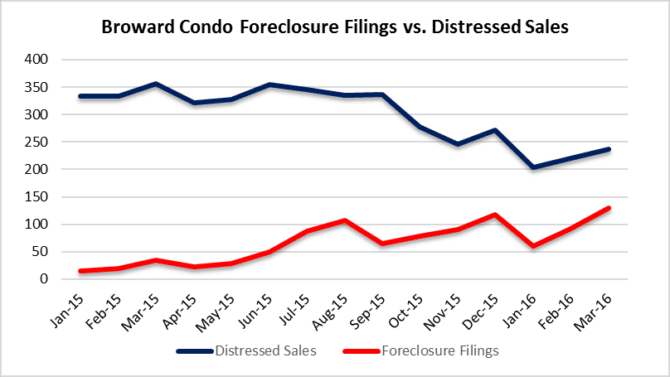 Our last chart today shows the pace of new mortgage foreclosure filings for condo properties compared to the pace of distressed sales (short sales & REO transactions combined). To prevent a build in distressed inventory, you basically want to be selling them faster than you get new ones. So far the chart looks o.k., but it is worth monitoring since the pace of new foreclosure filings appears to be climbing again. 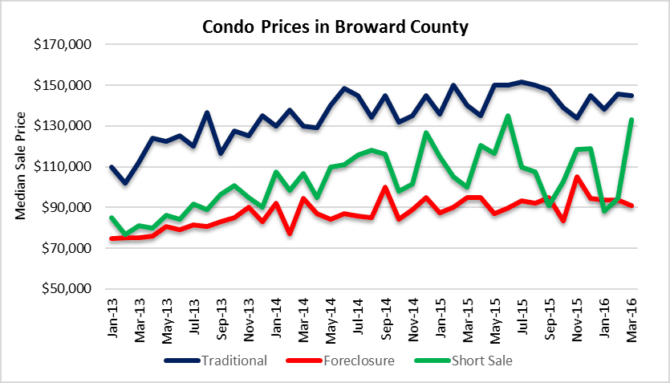 This entry was posted in Condo market, Fort Lauderdale foreclosures, Market Insight, South Florida Real Estate and tagged Fort Lauderdale condo market, Fort Lauderdale housing market, housing bubble, South Florida real estate. Bookmark the permalink. Trackbacks are closed, but you can post a comment.